"An alcoholic beverage good for business get-togethers." In a large bowl, combine vodka, cranberry juice and orange juice. Place in freezer for 2 hours, or until slushy. When slushy, mix in mandarin oranges and serve, or replace in freezer. A refreshing cocktail with vodka, cranberry juice, and exotic lychee liqueur. -a-Doodle-Doo Ashleigh! Made these to try before my next party and I'm happy to say that this rooster will definitely be making an appearance. Delish and thank you!! Yummy! 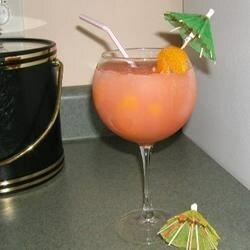 The oranges at the end of the drink are a nice treat but if you have everythig except the oranges, go ahead and make it!!! You'll love it on a hot summer day! Altered the number of servings to serve 15 and put in a punch bowl for a Christmas party. Everyone loved it. Yum...tasty and so easy to make!